Arthroguard is a natural product for people who want to help maintain good bone and joint health. As we age, joints become worn, leading to friction between the bones which results in inflammation, pain and stiffness. Because so many older people want to remain active for longer now, maintaining their joints is integral to their quality of life. 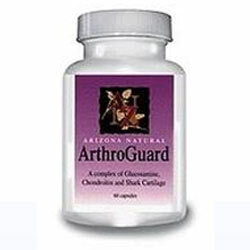 Arthroguard is available from the manufacturer, Arizona Naturals, an established company that produces a wide range of non-prescription herbal remedies. It can be purchased at a cost of $14.88 for a bottle of 60 capsules, although not knowing the dosage means there is no way of telling how long one bottle lasts. The Arizona Natural official website is reasonably informative – there is information about the company and full contact details, although they do not mention product guarantees or include any clinical studies for any of the brands. The Arthroguard formula is very standard for this type of product, containing the two substances essential to repairing and strengthening joints, Glucosamine and Chondroitin. These two ingredients work together, effectively rebuilding broken-down cartilage and connective tissues, and they are included in this formula at their optimum amounts. The full ingredient list for Arthroguard is not shown but the formula also contains an amount of shark cartilage, which acts as an inflammatory treatment and contains strengthening calcium. This type of joint treatment should really be used as more of a preventative step, rather than relying on it to be a solution to joint pain. The key ingredients are certainly beneficial but it would also be good to see the addition of a lubricating substance to further decrease friction in the joint.